utterances by (generally speaking) someone famous. 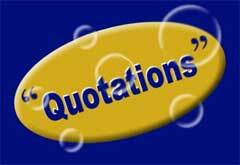 Quotations can be maxims, aphorisms, striking fragments of poetry, humorous or impressive prose and remarks, coinages of new phrases or ideas, remarks at historical events, putdowns of others, famous last words or anything else which is worth repeating on its own, possibly with some comment on when, where, and on who. Buddha was asked, ” What have you gained from meditation ” . He replied , nothing . However , Buddha said , let me tell you what I lost: Anger, Anxiety, Depression , Insecurity, Fear of old age and Death. Do not speak about your money in front of a poor person. Do not speak about your health in front of a sick person. Do not speak about your power in front of a weak person. Do not speak about your happiness in front of a sad person. Do not speak about your freedom in front of a prisoner. Do not speak about your children in front of an infertile person. Do not speak about your mother and father in front of an orphan. Because their wounds cannot bear more. A warm smile is the universal language of love & kindness. A gentle word, a kind look, a good-natured smile can work wonders and accomplish miracles. When I look out at the people and they look at me and they're smiling, then I know that I'm loved. That is the time when I have no worries, no problems. My promise to my children - as long as I live - I am your parent first, your friend second. I will stalk you, flip out on you, lecture you, drive you insane, be your worst nightmare and hunt you down like a bloodhound when needed because I LOVE YOU! When you understand that, I will know that you are a responsible adult. You will NEVER find someone who loves, prays, cares and worries about you more than I do! If you don't hate me once in your life - I am not doing my job properly. They remain with you for ever.!!!!! An art for a lover. A profession for a lawyer. A requirement for a politician. A Management tool for a Boss. An accomplishment for a bachelor. A Matter of Survival for a married man. But When You Enter Into The Dark ,Even Your Own Shadow Doesnt Follow You." "If We Are Not Part Of The Solutions, We Are The Big Problems"
Winners Never Do The Different Things, They Do The Things Differently". Though you cannot go back and start again, you can start from now and have a brand new end. To keep a lamp burning, we have to keep putting oil in it. We can do anything we want to do if we stick to it long enough. No matter how far you walk, how hard you work, or how bad it hurts, you'll always get to where you need to be. But only true friends will leave footprints in our heart. You can't live long enough to make them all yourself.